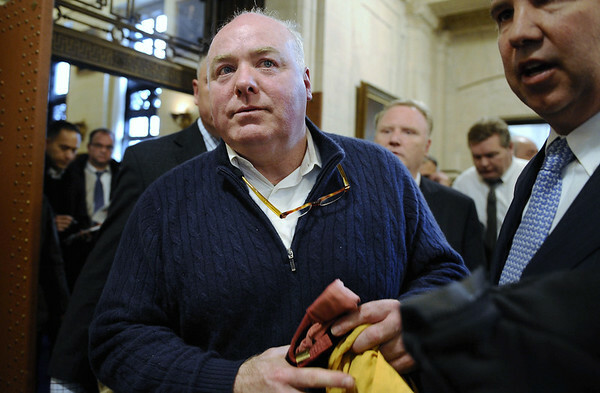 HARTFORD - Connecticut prosecutors on Thursday asked the U.S. Supreme Court to hear their arguments for reinstating Kennedy cousin Michael Skakel's murder conviction. The state Supreme Court in May reversed its own 2016 decision and vacated Skakel's conviction in the bludgeoning death of Martha Moxley in their wealthy Greenwich neighborhood in 1975, when they were teenagers. The 4-3 majority said Skakel's trial lawyer failed to contact a witness who could confirm Skakel's alibi, that he was miles away watching a Monty Python television show with friends when Moxley was being beaten with a golf club. Chief State's Attorney Kevin Kane and prosecutor James Killen, in asking the U.S. Supreme Court on Thursday to take the case, argued the state court didn't properly weigh the overall performance of Skakel's defense against that mistake. Skakel is a nephew of Robert F. Kennedy's widow, Ethel Kennedy. After decades of investigations into the Moxley killing, Skakel was charged in 2000 and convicted in 2002. The state's case included nearly a dozen incriminating statements witnesses said were made by Skakel over the years. His appellate lawyers argued that his trial lawyer, Michael Sherman, made a series of poor decisions including failing to present the alibi witness and failing to argue that others, including Skakel's brother, could have been the killer. Skakel served 11 years behind bars before being freed on $1.2 million bail in 2013 when a lower court judge overturned his conviction, citing mistakes by Sherman, who has defended his work. Prosecutors appealed the lower court ruling to the state Supreme Court, which reinstated Skakel's conviction in December 2016 in a sharply divided 4-3 ruling in which the majority said Sherman's representation was adequate under the U.S. Constitution. Skakel's new lawyers asked the high court to reconsider, resulting in the reversal, which some lawyers and law professors have called unusual. The justice who wrote the 2016 majority decision, Peter Zarella, left the court shortly afterward and a new justice, Gregory D'Auria, voted with the majority in May. Posted in New Britain Herald, General News, State on Thursday, 9 August 2018 14:54. Updated: Thursday, 9 August 2018 14:56.